Hello! I am back today with another series of tips for taking photos of children. Once again, I am not a professional photographer. I am just a mom who dotes upon her children and wants to have the best possible pictures of them. Really, I’m just a mom–because by definition a mom wants the same things that I want–we want to preserve and capture the beauty of every moment we can. So, I take a lot of pictures. Lots. Some of them turn out…others do not. I try to pay attention to what works and what doesn’t. 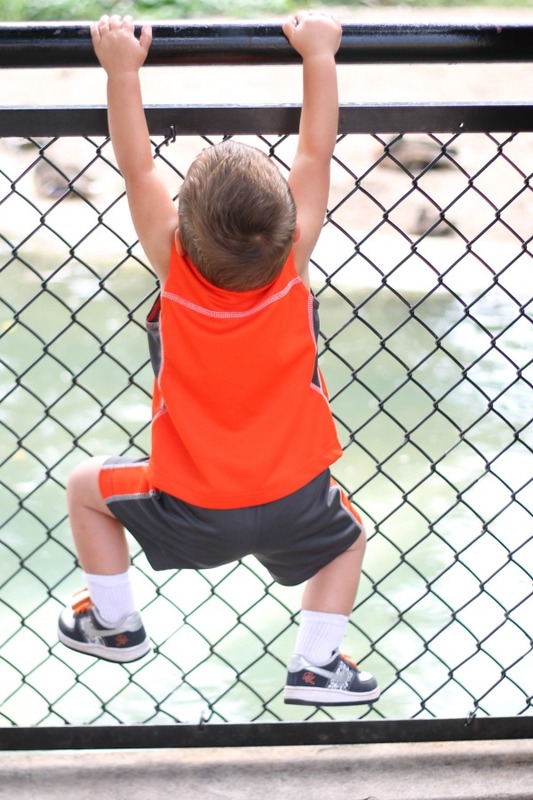 Here are some tips I came up with for capturing your children while active. 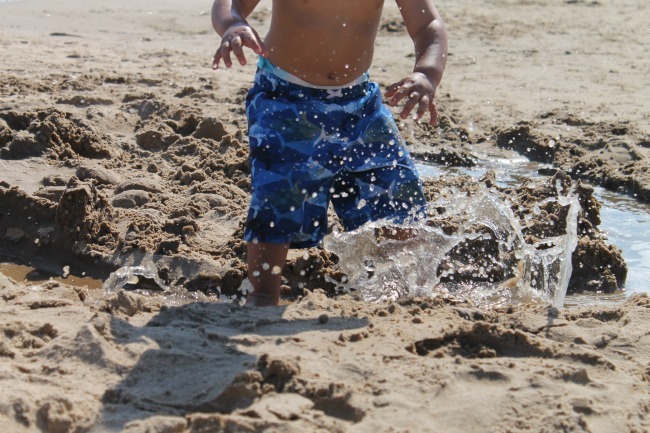 I have a VERY busy two year old, so capturing action is what I do every day. I hope these tips help you! First, a quick word about shooting ACTION. When taking an action shot you shouldn’t be concerned with the SMILE. Of course, the best pictures are when there is a toothy grin, but an action shot is more concerned with capturing movement, life and fun of the whole situation. It is okay to take a shot of the back of a kid’s head, or the side. What is most important is that you let the kids be active, and just take pictures as you are able. This is basically the cardinal rule of taking pictures of kids. The other rule is that when you think you are going to get some great shot–you won’t. For this reason I always have my camera slung around my neck when I am heading outside with the kids. Don’t worry about keeping your camera close indoors–it’s outside that you need your camera. Here is a shot I snapped of my baby girl a few weeks ago. It was her first time in a big swing and she loved it! She was making this face as she swung toward me and I snapped a picture quickly…and I am so glad I had my camera with me. Stage an action shot? May sound impossible, but by staging an action shot I mean simply pick a good place to stand. 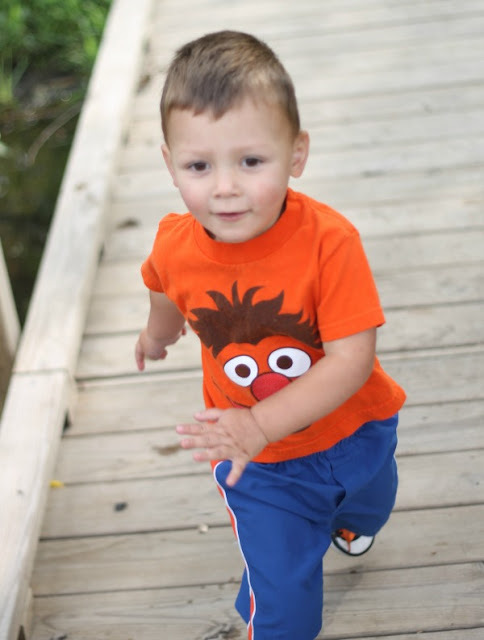 Here is a shot of my little guy running. I love that smile because it is a real, life is awesome, in the moment smile. I staged this shot by standing in the middle of a dock that I knew he loved to run down. Then, when he stared running he had to pass right by me. Because he ran up and down the dock several times I had apple opportunity to snap a picture of him in full motion. This picture was not staged, in fact at the time I was mad it was happening. I was taking some picture of my blueberry/basil smoothie…and some one was busy helping me. Very busy. 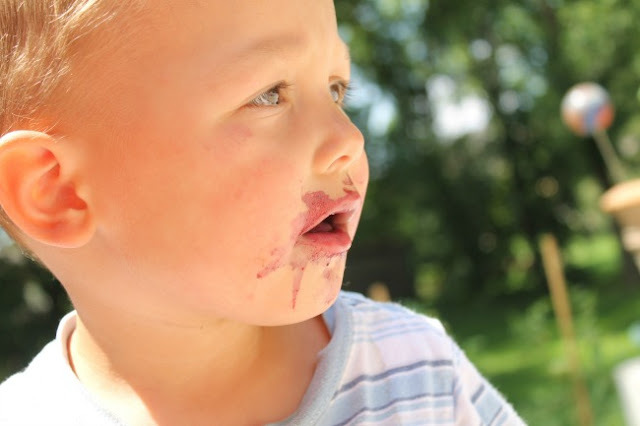 But, in retrospect, I’m happy to have these fun shots of a little boy with a messy face. The walking away picture is one of my favorite. It works well with kids that are at that stage where they either refuse to look at the camera or have strange smiles (are my kids the only ones that go through that phase?). 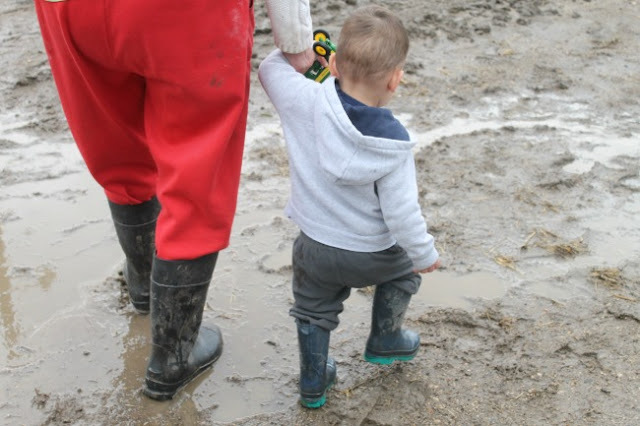 The above picture is of my mom and little guy stomping through mud puddles this spring. As a photographer I used to feel like I had to be in front to get a good shot. But try taking a few shots from behind! Kids are kids. By definition they are silly and busy and active. In the above picture we were at the zoo. Beyond the fence are a whole mess of ducks and flamingos. I was *trying* to get a shot of my little guy looking with wonder out at the birds. But, someone wasn’t interested in the birds. He only wanted to try and climb the fence. So, I swallowed the urge to correct him, and snapped this run picture of my little guy being himself. All of the other tips here can be achieved with any type of camera, expect this one. I have a Digital SLR camera which allows me to take several pictures very quickly. Before, when I had an old point and shoot I would get so frustrated at the delay. Hit the button–wait–flash–picture. By the time the camera actually took the picture my busy little subject was out of the room onto something else. So, for what it’s worth, consider getting a camera take takes pictures quickly. 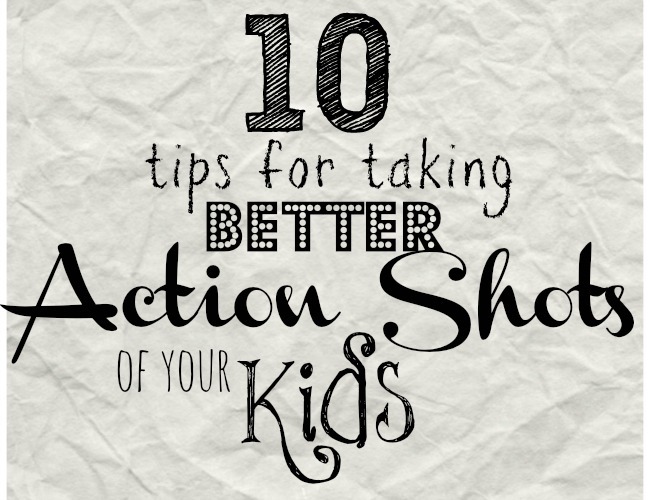 It will help you capture your busy little people. Ha! I love this picture. 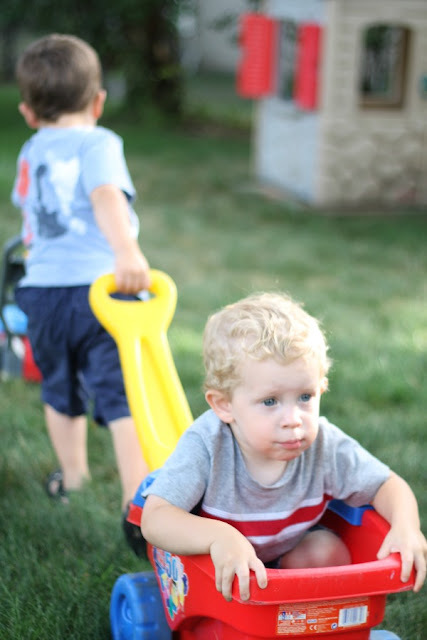 I love the fact that the big brother is both pushing a toy lawn mower and pulling his brother in the wagon. 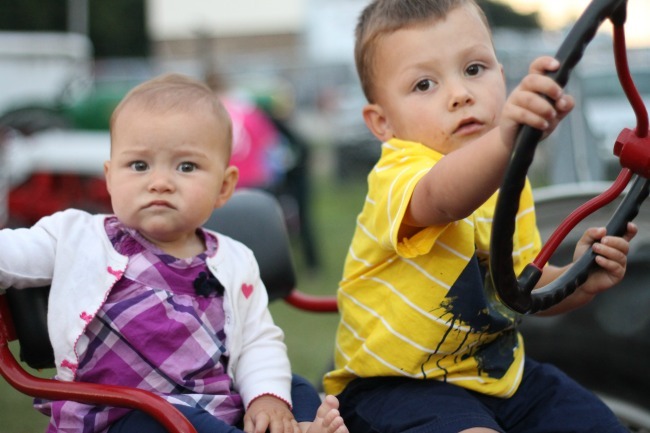 But, what I love more is the resigned look on the little brother’s face. He doesn’t know where he’s being taken, and I guess he’s okay with that! 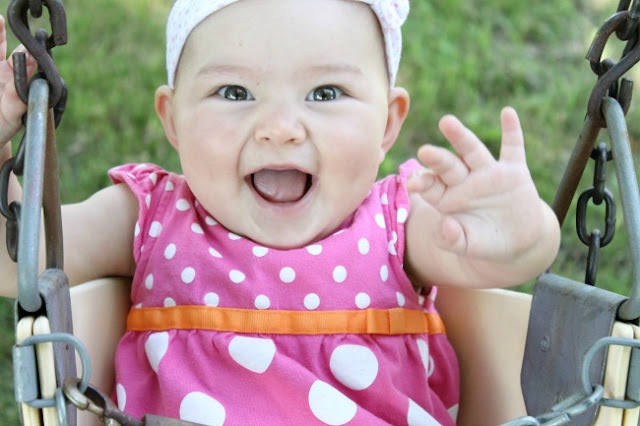 Kids are not only cute, they are funny, and I love it when pictures are able to reflect that! Outside pictures are always best. Always. Some of the WORST backdrops for pictures are carpet and clutter–two things in no short supply when you have kids. No matter how clean or well-lit your house is, it is always better to be outside, especially during the “golden hour” when the sun is setting and the light is gentle and soft–even if your baby is a little grumpy! The above picture is the best I could do for a 2 year old shot of my son. At that time he just REFUSED to look at the camera. It’s not my favorite picture of him, but I think it’s interesting and fun. He is true to him. 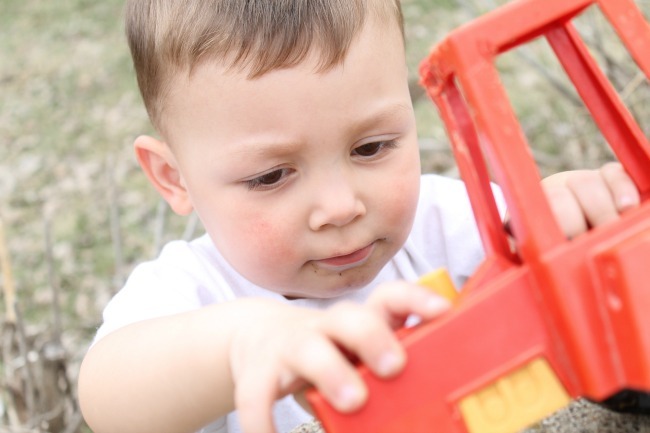 He is incredibly into trucks and tractors. This picture works for me because the toy isn’t obnoxious. Also, I can see his face and how much he loves that tractor. I’m ending with probably the poorest quality picture, but I think I love it the most. Here’s the backstory. I had a baby mid November, so although we had planned in going to see my husband’s family in PA for Christmas, we didn’t make it. Instead we had a quiet Christmas at home, just the 4 of us. In the picture my husband is face-timing with his family on Christmas Eve, and my son is happily blowing they kisses. Sweet, right? This is why I love capturing the active moments in life. This is so much sweeter than a staged portrait. I want a DSLR so badly for exactly that reason. By the time my camera takes the picture, my little man is over it and doing something else. Nancy, you take such amazing photos! Your family is absolutely gorgeous! I’m a mama of 4 very spaced apart kids, 14, 9, 3 & 12weeks so getting a good or better a great pic of all 4 is a feight all in itself. I love ur simple yet right on answers & pic up tid bits I thought I knew but didn’t. Thank u for ur blog! !